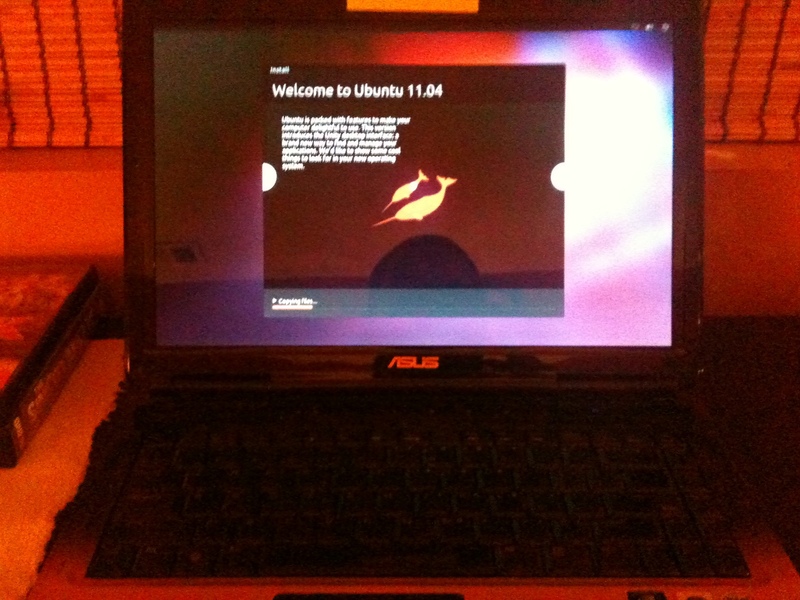 After solving my Windows Vista64 problems, I decided to give Ubuntu 11 a try. Contrary to what I had been hearing on the net, the download and installation were absolutely painless. Ubuntu does take a bit of getting used to, but the installation was a lot faster and way more user-friendly than anything I have ever experienced with Windows. The positives: This here Asus laptop came with WinV64, and the [function] keys don’t really work. For example, adjusting display brightness, volume control etc. have to be done with the trackpad and GUI. However, with Ubuntu 11.04 it just works! Hold the [function] key and press the corresponding icon (F5-6 for display brightness, F11-12 for volume). Really a kick in Windows’ (or Asus?) face, considering this laptop came with WinV64 pre-installed. I also like Ubuntu’s battery icon and power management better. Finally, it makes dual-booting easy for the layman enthusiast (me). On the flip side: getting the hang of it is a different story. Maybe it just takes time, but for now I find WinV64 generally easier to use – except for the things noted above. Nevertheless, considering Ubuntu is available for free, I would heartily recommend anyone with some spare hdd capacity to give it a try! edit: another win for the linux team: fast and straightforward installation of HP network printer drivers. A minor negative would be the aesthetics: I’m a Mac user and I find the Ubuntu GUI not the most pleasant to look at. I’ve downloaded a few different themes, but they don’t make much of a difference. It’s not a dealbreaker, though. It looks decent enough, just not great. I hope someone will develop a slicker GUI, as long as it is not detrimental to performance. This entry was posted in ENGLISH, OPINIONS on October 8, 2011 by Menno de Boer. In the looks department you could try another theme (some are more pervasive that others) or another window manager like Gnome or KDE or even enlightenment (17) if you are feeling adventurous.